Drizzle garlic with olive oil, then wrap in aluminum foil. Bake in preheated 350 degree oven for 1 hour. Boil potatoes until tender, about 15 minutes. Drain, cool and chop. Stir in butter, milk, salt and pepper. Remove the garlic from the oven, and cut in half. Squeeze the softened cloves into the potatoes. Blend into potatoes and continue “smashing” mixture until desired consistency is achieved. Note: Minced garlic purchased at the store may be substituted in this recipe, but the roasted garlic gives the potatoes that extra good flavor. 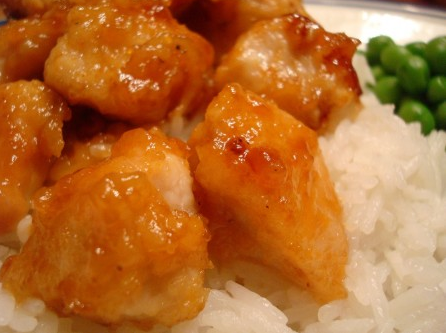 Emilie shared this yummy recipe with me. Grease and flour bundt pan. Dissolve lemon Jell-O in hot water. 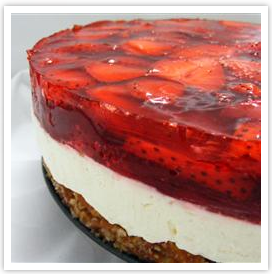 Mix cake mix, lemon extract, eggs, oil, water and Jell-o. Bake 350 degrees for 40-45 mins. 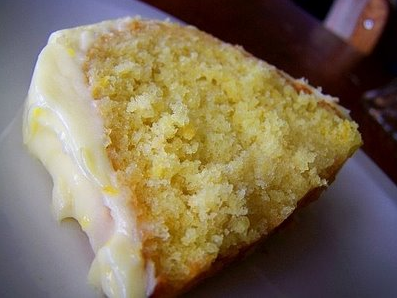 Glaze: 5 tsp lemon juice 1 1/2 C powered sugar Mix together until smooth. (Add more lemon juice if too thick). Poke holes in top of warm cake and immediately pour glaze over cake. In a large bowl, cream together butter and sugar until smooth. Beat in eggs and vanilla. Stir in the flour, baking powder, and salt. Cover, and chill dough for at least one hour (or overnight). Preheat oven to 400 degrees F (200 degrees C). Roll out dough on floured surface 1/4 to 1/2 inch thick. If it is too sticky, add a little powdered sugar to dust it instead of adding flour. Cut into shapes with any cookie cutter. Place cookies 1 inch apart on ungreased cookie sheets. Bake 5 to 8 minutes in preheated oven. Cool completely. Watch closely. Remove from oven when cookies begin to brown around edges. Tip: Use parchment paper to roll cookies on so bottoms won’t burn. Heat olive oil in a large nonstick sauté pan over medium-high and add kielbasa. Cook, without stirring for 1 minute. Then stir occasionally for about 3 minutes. Transfer to a plate with a slotted spoon. Mix in the vinegar and mustard; add the sausage back to the pan and cook for another 2 minutes to heat through. Taste and adjust seasoning, if necessary. Serve immediately on its own or over mashed potatoes. Preheat oven to 350° F. Grease and flour a 9×13-inch baking pan. In a mixing bowl using a spoon, mix the cake mix, butter or margarine, and 1-egg. Pour mixture into pan and level across pan. 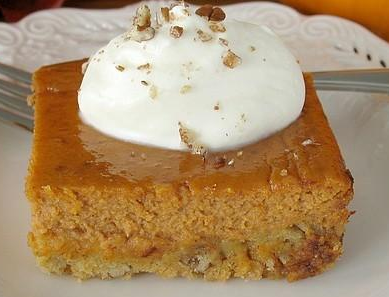 In another mixing bowl, mix the canned pumpkin, 3 eggs, evaporated milk, brown sugar, sugar, cinnamon, and nutmeg. Pour ingredients into pan and spread over first layer. To make the topping, in a mixing bowl cut butter or margarine into the reserved Yellow Cake Mix, add the sugar and mix nuts. Sprinkle over Second layer. Bake for 50 to 55 minutes. Cool for 30 minutes.